A neighbor confirms to NBC4 that the smiling man in this Facebook photo is Gerardo I. Hernandez, 39, of Porter Ranch, who was shot and killed Nov. 1, 2013, while working as a TSA security officer at Los Angeles International Airport. 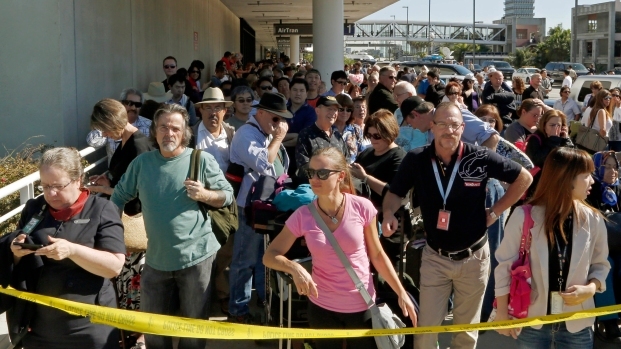 Despite efforts of doctors to revive a severely wounded TSA shot at LAX earlier this month, the 39-year-old man was shot 12 times and died minutes after being shot, an autopsy report released Friday said. Gerardo Ismael Hernandez was killed on Nov. 1 when a gunman with a grudge against the TSA fired bullets from an assault rifle in LAX’s Terminal 3. He arrived in the hospital in full cardiac arrest, the autopsy said. Despite desperately trying to save his life, doctors pronounced Hernandez dead at 11 a.m., two hours after the shooting. The coroner announced Wednesday that Hernandez died within two to five minutes of being shot. Hernandez was working at a lower-level passenger check-in station when an alleged gunman, Paul Anthony Ciancia, 23, pulled a semi-automatic weapon out of a duffel bag and began shooting. Trauma surgeon David Plurad said Hernandez had no signs of life when he arrived at Harbor-UCLA Medical Center. Doctors worked for about an hour to revive him despite significant blood loss. For all but five of those minutes, there was no threat from the suspected gunman — he had been shot and was in custody, they said. While it’s not known when Hernandez died or if immediate medical attention could have saved his life, officials are examining what conversations took place between police and fire commanders to determine when it was safe enough to enter and whether paramedics could have gone into the terminal earlier, one of the officials said.